Try to choose land that slopes North or East or North-East for ideal peaceful and prosperous living. This will allow your home to capture more of the morning sun and cosmic rays that rise from the Eastern direction each day and night. 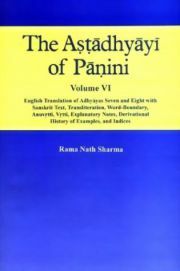 his volume of the Astadhyayi of Panini contains English translation of adhyayas seven and eight. It includes Sanskrit text of individual sutras with their transliteration, word-boundaries, indication of inflectional endings and formation of compounds. Each sutra is also furnished with anuvrtti, vrtti, examples; detailed explanatory notes and complete derivational history of examples, cited by the Kasikavrtti. Explanatory notes are presented to facilitate proper understanding of individual sutras, especially in view of their formulation, interpretation, application and relative placement in the grammar. An attempt has been made to sort out and explain pertinent issues, as raised and discussed by major commentaries particularly the Mahabhasya of Patanjali. Derivational details of examples, unlike earlier volumes, are furnished under explanatory notes of individual rules. This completes the author’s six-volume study on the Astadhyayi of Panini. Bibliographic Information: First Edition. 846 Pages. Who is this Shama Churn?